Are You Making These Common Mistakes When Using Pest Control Products? If you’re dealing with a pest infestation in your home or business, you probably want to begin the pest control process as quickly as possible. We’re with you. There are few unwanted guests worse than pests. However, before you begin your pest control treatment, you’ll want to be sure that you’re set up to make the right moves and avoid mistakes. To help you out, our pest control professionals here at EcoClear Products have put together this list of common pest control mistakes that property owners make during pest treatment and prevention. We’ve also included information and resources on our very own eco-friendly pest control products—great for treating infestations of all kinds. Read on for 5 Common Mistakes Made When Using Pest Control Products, and shop eco-friendly pest control products with us today! 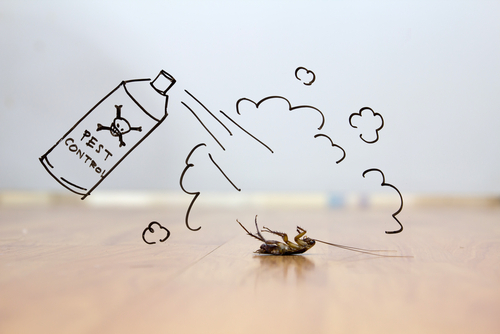 The moment you see insects crawling over your counters or rodents scurrying across your floors, you’ll be tempted to break out the chemicals and spray right then and there. But be careful: treating random sighting spots won’t take care of your pest problem—it’ll only provide a temporary setback for tiny home invaders. To ensure that you are treating your pest problem effectively, you need to pick your battles. Locate areas where pests are nesting and finding food. Take away sources of shelter and nutrition (wherever possible) and treat in these locations. If you suspect that pests have found their way into your home through holes in your walls, roof, or foundation, invest professional treatment to have these makeshift entryways blocked up once and for all. Baiting insects doesn’t really work. You can’t use bug sprays for rats. These are common-sense principles that most of us can agree to after a few seconds of thought. However, in the heat of the moment on the heels of a pest sighting, common sense often goes out the window. Tempted as you might be to use whatever pest solutions you have in your cabinet after seeing a rodent, reptile, or bug—we advise you take a moment to know your enemy. This is especially important for insects like termites or bed bugs that require intensive control. Treating the wrong pest species can lead to lost money and a host of unnecessary chemical problems for your property (depending on the product you use). Be sure to definitely determine the pest species you’re dealing with before you begin treatment. Whether you are going the DIY route or seeking professional assistance for your pest problem, you’ll always need to follow directions. Before spraying anything, read the instructions and warnings on bottles, boxes, and booklets thoroughly. Failure to do so can result in pest resurgence. Worse, it can lead to property damages and health risks for those under your roof (again, depending on the product you use). If you’re working with professionals to tackle your pest infestation, be sure to follow any instructions they give you as closely as possible. This will greatly improve your own safety and ensure that your pests stay gone. Speaking of staying gone—another mistake property owners make when treating pests is controlling and not preventing. In most cases, it’s not enough to simply take care of your existing infestation. Insects, rodents, and reptiles are incredibly resilient animals. Without proper prevention in place, they can return to properties even after extensive extermination. When you treat for pests on your property, pay special attention to factors that caused your infestation in the first place. Enlist the help of professional to pest proof your space, and stay on top of prevention year-round. Perhaps the biggest mistake property owners make when treating pests is using the wrong products. In this setting, “wrong” can mean a number of different things. Often times, “wrong” products are simply ineffective products. Other times, they are inhumane products—meaning they are especially cruel to the pests they control. And in many cases, pest control products are cruel on a much broader scale, posing health risks for people, pets, wildlife, and the environment at large. If you’re treating pests on your property, you want to be sure to choose products that are as effective, humane, and environmentally-friendly as possible. At EcoClear Products, we have your solutions. Our engineers have created a number of eco-friendly products designed to efficiently and effectively exterminate pests of all species, indoors and outdoors. From our humane and highly-effective MouseX®, RatX®, and RatRid™ products for mice and rats to our comprehensive Stop Bugging Me!™ product line for insects including, bud bugs, dust mites, ants, and many more, our pest control products are great for pest infestations of all kinds. Made entirely from naturally-derived ingredients, they use all-natural formulations to attract pests and humanely exterminate them as quickly as possible. 100% biodegradable for people, pets, livestock, and other wildlife species, they are the responsible choice for lasting pest control and prevention. Want to learn more about using pest control products in your home or business? Ready to give our eco-friendly pest control solutions a try? Explore our website for more information on our products and their many benefits, and contact us directly to speak with a member of our team. When you’re ready to start shopping, use our Store Locator to find an EcoClear Products retailer near you.